Traditional third sector funding models are no longer sustainable and are not adequate for long term growth ambitions. Many voluntary sector bodies are recognising this and adopting a new enterprise approach which goes well beyond grants. The Work It Out! Income Generation programme has supported hundreds of third sector in the last three years. We have helped to create an enterprise culture in organisations, built a network of social enterprises and worked with isolated and village and rural communities to enable them to grow globally from a local base. We can help your organisation to achieve its aims by quickly moving from dependency and grants - to building a secure range of income streams and becoming fully sustainable. Join our three month process and transform the potential of your organisation. We deliver this 3 month programme to help third sector organisations realise their potential. We want you to build on your good works. We want you to achieve all that is important for the people that you help and serve. We want to help you do much, much, more. You will identify a minimum of six new income streams that you can develop by the end of the programme, You will have your first income generating books ready for Amazon. You will know how to promote your key message and vision globally - and get paid to do it every month. You will know how to recruit a virtually limitless supply of volunteers and support staff for free. You will be able to turn every grant into an everlasting income stream. You will have a course or a product that is capable of being licensed internationally earning you hundreds of thousands of pounds per year - starting in 2019. This consists of 6 half day group training sessions with ongoing individual support. There are a series of actions to be undertaken between each session which will drive the income generation process and ensure results for each organisation. The Collective Coaching methodology enables all organisations to support each other - quickly learning and then delivering new income streams. Using all our individual skills and experience to build income streams. Harvesting what we already know for immediate income. 50 Income generation ideas specific to your Organisation. How to build Passive Community Income – sit back and relax? Marketing and selling your products online - easy, fast and profitably! Licensing your training courses, services and products to others for massive income growth. Please complete and submit this form to participate in the 3 month Programme. We will confirm your places and send you an invoice which is due for payment by the 5th December. Please note that places are limited. To ensure that your Organisation benefits from this Programme please complete and submit the online form. above. You can contact Des McCabe at diversiton@gmail,com / 07717 203325 if you have any queries.to edit. ​for 50 leading third sector organisations is sold out. A one day in-house programme for Third Sector Organisations including Community Groups, Voluntary Organisations, Social Enterprises and Charities. To design and develop a range of new income streams, revenue generating projects and options suitable for implementing in each organisation. Recognising the new financial landscape for community groups. How individual sustainability creates community wealth. Sustainability is not a ‘bolt on’. Strategic positioning to give you real value. Grants are temporary - products are permanent. Self generated, Passive income and Investment income - getting a plan for each. Empowering and engaging your people for income generation. Premises and assets - 4 Case studies. 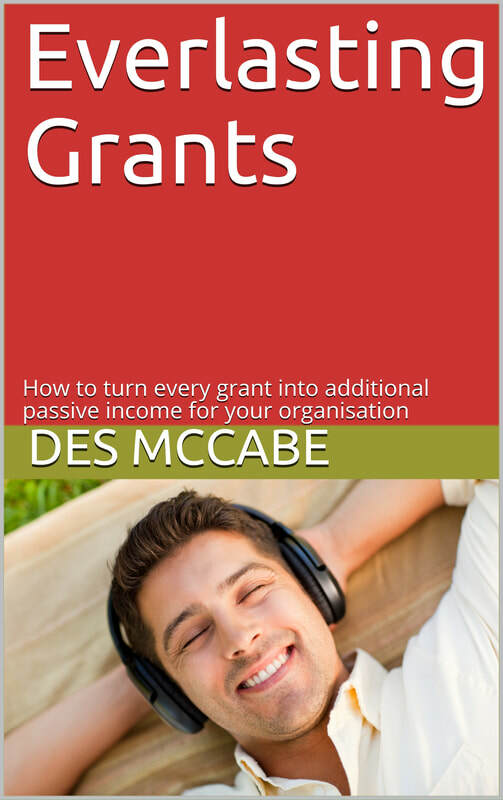 How every grant can create ongoing permanent income streams. Key process for building self generated income. The top 15 most popular community businesses that every voluntary organisation could be earning from. How to identify, build and leverage your assets..
How to design and build community workpieces. How to write and sell ebooks online. Earning monthly income from Amazon. What books, courses, products, memberships, events, activities, mentoring, tutoring, coaching, advisory services, etc can people buy from your website? How to segment and monetise your core skill into 30 different income streams. Driving the Sustainability process and making it happen - from today! How to ensure that individuals are responsible for key activities and that there is shared ownership of the process and tasks. Sustainability skills and longer term strategy. 'I feel inspired and motivated! I believe we can make a much stronger contribution to our community now'. The half day workshop is suitable for 12-36 people. We often deliver sessions for staff in one organisation or for a mixture of groups locally. This is a great way to share experience, ideas and build local capacity. The Workshop costs £900 which is fully inclusive of travel and trainer accommodation. No VAT is payable. We will discuss potential dates, venue and other practical arrangements with you when you contact us. We can invoice you. If you need to include a Purchase Order number please email Sharon(at)diversiton.com - call 02841 754 777. Payment is due within 30 days - after the workshop. What was your overall impression of the workshop? Really excellent, motivational, inspiring and enlightening day! I found it very useful and comprehensive. It really made me think about sustainability in a different way. Interactive, buzzing atmosphere fast paced - brilliant session! Very informative course with fun activities. Really positive with some real thinking outside the box. Innovative ideas for creating opportunities to monetise business. Very interesting – I learnt a lot! Des kept everyone totally engaged. Good to think outside the box! Undoubtedly the best course I have ever been on.! Very helpful, some of this has been in dusty corners of the mind - but the overall framework makes such sense. Very interesting – makes you think about what you are doing day to day. Helped to motivate me to action. Very good – made you think about different ways to generate income. Des – your delivery style was very engaging, I really enjoyed today! ​Understanding what income generation is. Thinking through the income process and learning how to do this step-by-step. Finding real ways to implement income ideas in my organisation. Feeling confident in generating income. The five area planning diagram. Partnership working throughout the day in different groups. Great Resources – especially around websites. It gave me the chance to focus on what we should be doing. Sales ideas for our organisation. All of the case studies – especially ‘Mary’. Learning new business selling methods to increase revenue. Having the opportunity to take time out from work and to think about our organisation and its future. Segmenting and monetising our core area - all new - brilliant! The reassurance in building Workpieces. The session on monetising what you already do. Learning how to write and publish E-books - and starting! Looking in depth at our own skills and how to use them. Sharing what others do & how we can work together. Knowing 'how' to think outside the box. I really like the stories which related to our specific issues. Getting a plan and a focus. The ideas around the tables on how to generate income. Great opportunity to network in a positive way. One new colleague kindly acted as a critical friend! What are the best income generation ideas you came up with for your organisation? ​How we can create natural products. Selling our training to others. Marketing play sacks and activity packs for our nursery. We can license our training courses. How we can adapt what we already do to create new income streams. Creating linked products to sell through our shop e.g. framed pictures, etc. How to write and sell 'How to’ e-books on Amazon. Giving individuals responsibility within our organisation for income generating activities. Café hub in deprived areas – making it happen! Identifying profitable new add-on services that we can provide. How to grow our charity shop. Self-help book for bereaved gentlemen. How we can deliver online training. Cashing in on the resources you already have - and your expertise. Building ownership for income generation by everyone in the company. Guide - How to survive online dating at 60! Packaging herb baskets and planters. Where to expand our foot care range. Train Mentors and Champions to deliver our courses. Deliver webinars for training workshops. Making better use of the space that we rent out. Developing a range of Merchandise. Local resource help book for men.